The Original Plan. 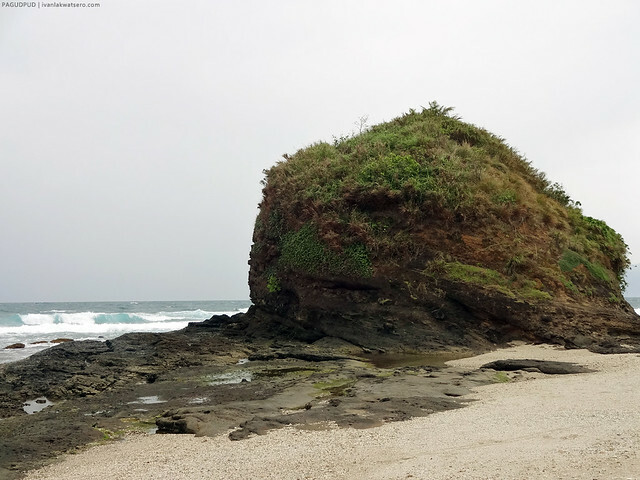 I was hoping that on my 22nd birthday, I will be celebrating it in the province of Batanes, together with the cows, and the hills, and the rock houses, and the Ivatans with their vacul. It's a dream destination so I see no reason not to be so excited. At first, everything just went smoothly—I already got a round trip ticket, an approved full week vacation leave, a well tailored itinerary, and a bunch travel buddies. Naghihintay na lang kami ng travel date namin. But two weeks prior to our trip, I received an email from the airline company saying that our flight is cancelled. F*ck. The Plan B. Still recuperating from the cancelled Batanes trip, I turned my eyes to Mt. Guiting Guiting (G2) in Romblon. I told myself, G2 would be the perfect substitute. So I fixed everything. 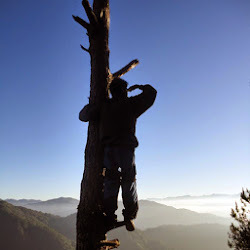 At first, everything went smoothly—I had contacted guides and porter in Romblon, supplies were bought already, and our little team is all geared up and ready. Naghihintay na lang kami ng travel date namin. However again, on the week of our hike, a typhoon entered the vicinity. Consequently, all ferry trips got cancelled. F*ck. Plan C. On the 19th of January 2014, as I mourn for the doomed travel plans, my girlfriend suggested an Ilocos backpacking trip instead, just for the two of us. 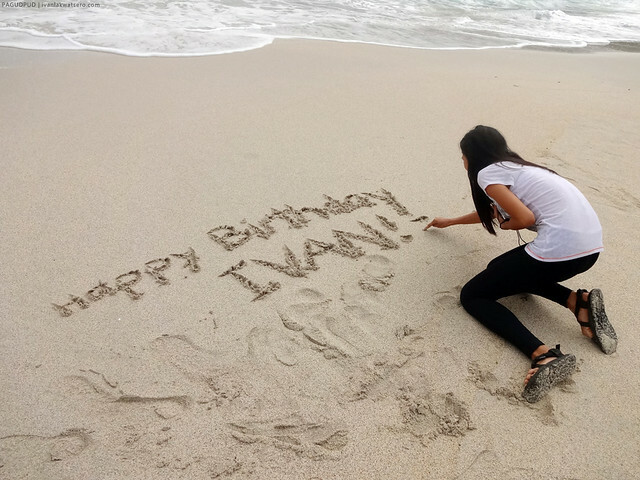 Although it's unplanned, it felt like I was destined to travel to Ilocos with Dawn on my birthday, so I readily agreed. Tatanggi pa ba ako? That very night, we left Manila to begin our spontaneous 4-day journey in the Ilocandia. Woohoo, para sa b-day trip ko 'to! Aboard Florida Bus, we traveled from Manila straight to Pagudpud. 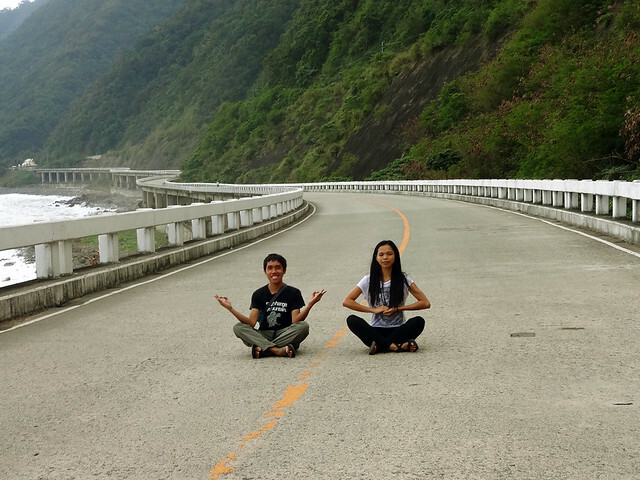 Given the fact that it is the northernmost town of Ilocos Norte and of Luzon Island, it took us around 11 or 12 hours on the road. It was almost 6 in the morning when we arrived in Pagudpud. no sun has showed up yet. Since this is entirely unplanned, we don't know exactly where to stay in town. Nag-browse lang ako ng mabilisan sa bahay tapos larga na kaagad. Like an innocent child lost in an unfamiliar place, we walked towards the central plaza and approached the tricycle drivers. I just told the driver to bring us to Saud Beach, then bahala na si batman. En route to Saud Beach, the driver asked us where we're staying, I replied to him a question "saan po ba ok na mag-stay na mura lang?" So he brought us to Britanya Lodge (P1000/night). We also agreed with his offer of touring us around Pagudpud for only P600. Not bad right? 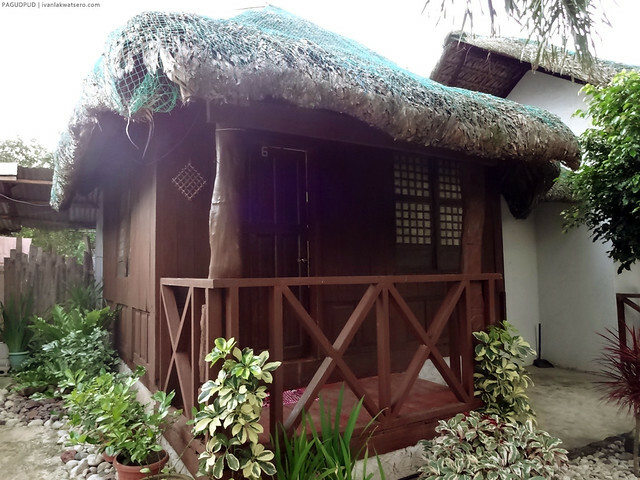 this small cube house is our home in Pagudpud. 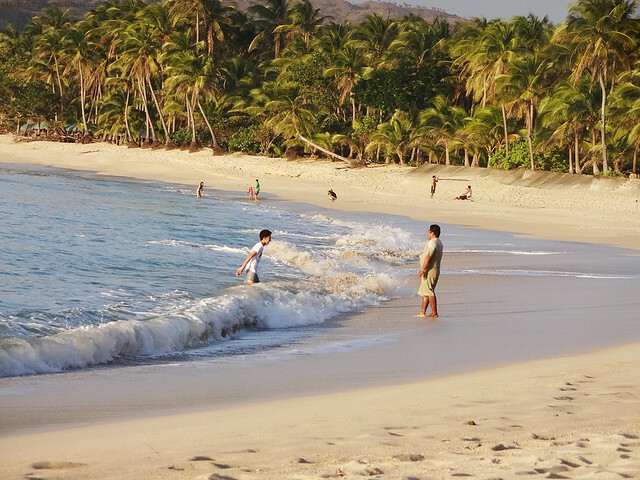 Our home is just a few walks away to the beach. We can hear from our place the calming sound of the waves. It was inviting. As soon as we settled in, we marched towards the beach to see what many Ilocanos would proudly say "the Boracay of the North." That day was a very fine day to be on the beach, weather was perfect and not too many people were there to ruin the place's serenity. Nakapunta na ako dati sa lugar na 'to, pero ngayon ko lang siya na appreciate ng husto. waves coming from the West Philippine Sea were too rough, making Saud Beach an unfriendly beach for non-swimmers. 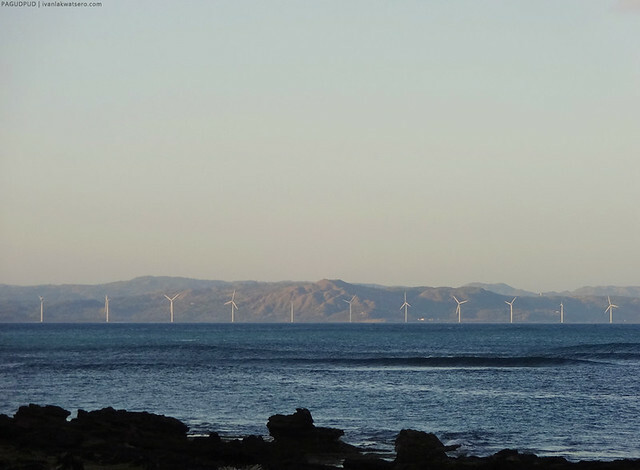 And look, the famous wind turbines of Bangui can be seen from Pagudpud. Saud beach was too good and too relaxing. In fact, staying there alone can already make up for a splendid vacation. But then, going elsewhere in town could make this splendid trip even better. 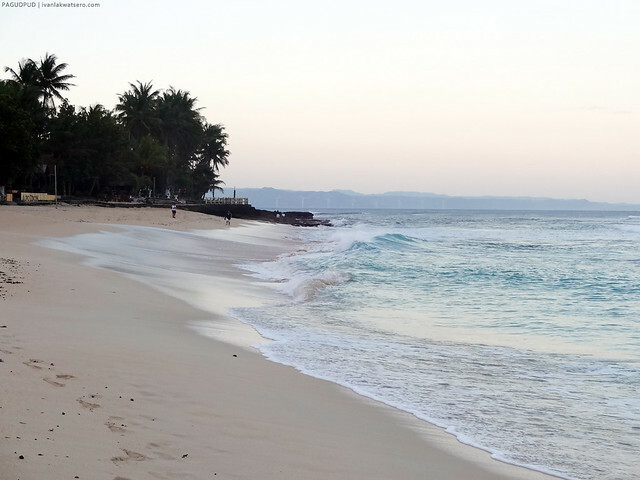 Pagudpud has a lot more to offer aside from the white beach. Conveniently, most of these will be covered in the tricycle tour I arranged earlier. while waiting for our tricycle driver slash tour guide, we had an Ilocano breakfast on a beachfront restaurant. 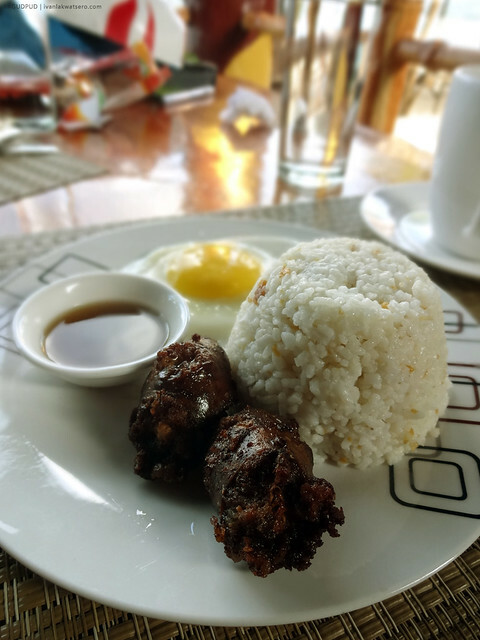 Ilocos longanisa plus sukang Iloco, panalo! At 8AM, our tricycle came to pick us up, commencing our Pagudpud tour on a tricycle. 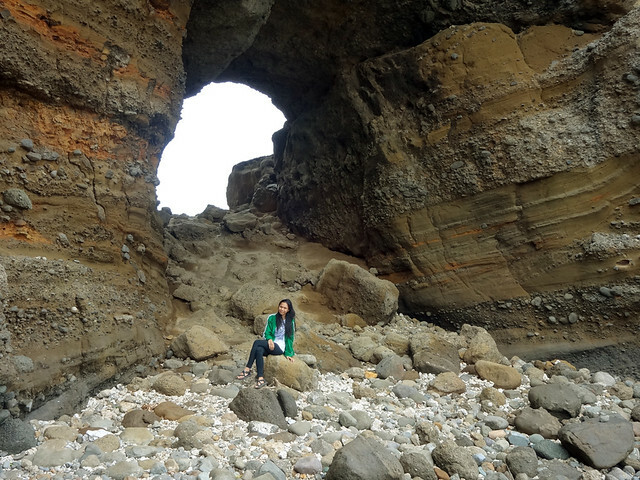 It comprises a waterfalls, an engineering feat, a rock formation, and another beach. All these cost only P600 and some other fees. Traveling on a tricycle, we reached the jump-off at Brgy. Balaoi in around 20 minutes. 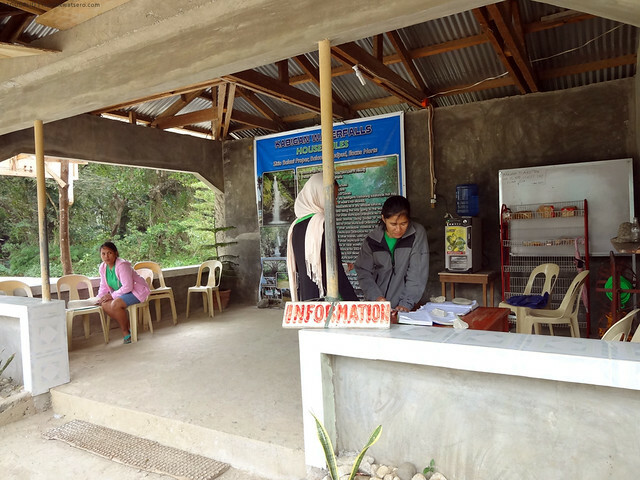 There, we paid for the environmental fee (P20/head), then were assigned a guide to bring us to the falls. 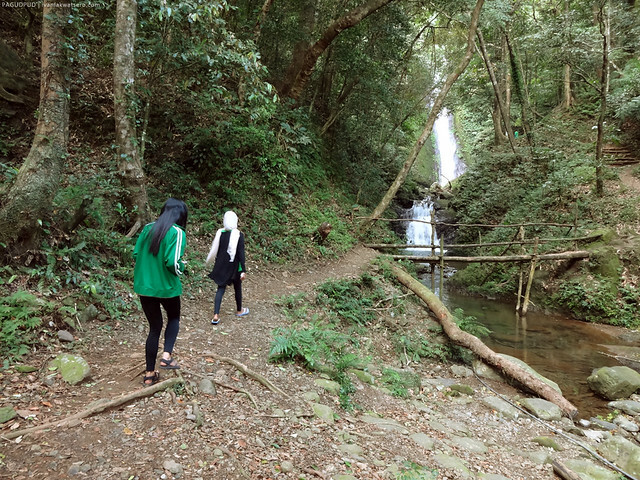 Unlike many other scenic waterfalls that usually require its visitors to go over long obstacle laden trails, this 120 ft tall Kabigan falls is actually reachable through an easy, painless, straight forward trail. 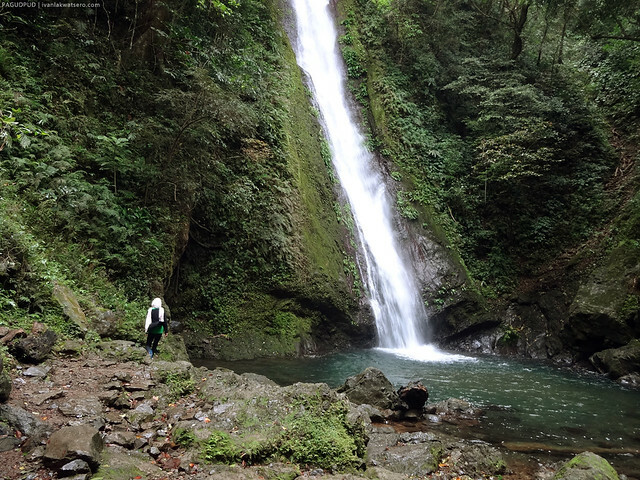 It only took us about 30 mins from the jump off point, through rural lands, up to the proud waterfall. easy way to the falls, petiks! 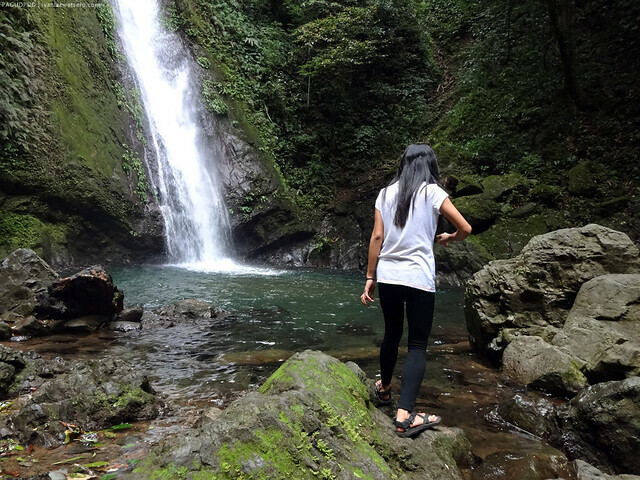 for people who are used to trekking longer and harsher mountain trails, this trek to Kabigan falls is just a piece of cake. Just stroll for 30 mins, and vwalla. Honestly, I was not expecting anything so good about it. I thought it's just a typical water cascade, nothing special, nothing to yearn about. 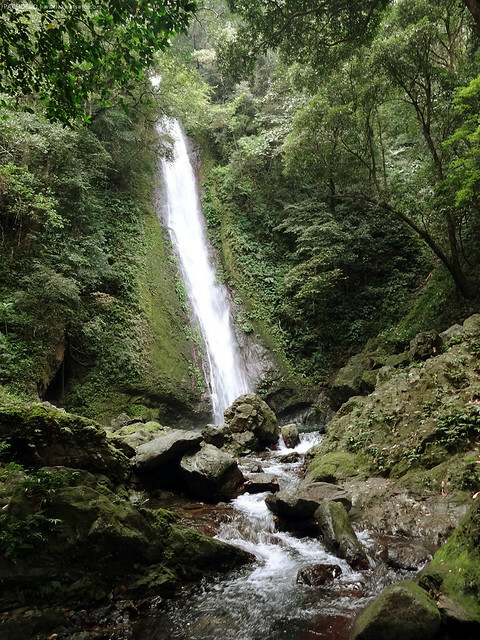 But the moment I gazed upon Kabigan falls closely, I was stunned. It's actually gorgeous. And the mere height of the falls is marvelous. There's a pool right below the falls and taking a dip is possible. We dared to take a dip, pero sobrang lameeegg! Since the very cold water refrained us from taking a dip in to the pool, we burned our time on taking selfies instead. And after a good 15 to 20 minutes in the falls, we headed back to the jump-off so we can proceed to the next stop in our Pagudpud tour. 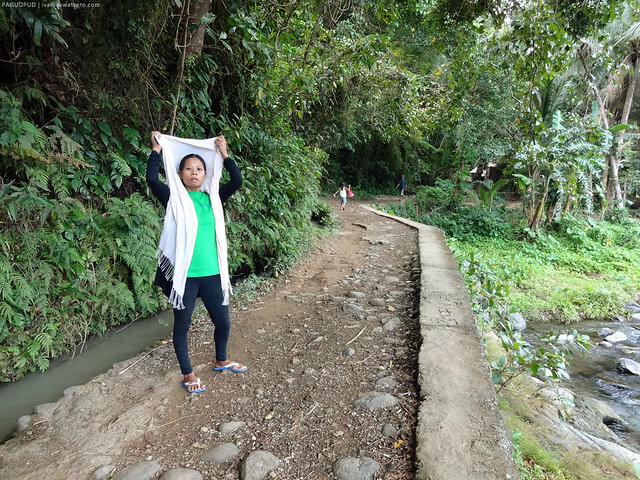 Not too far from Kabigan falls is our second destination. 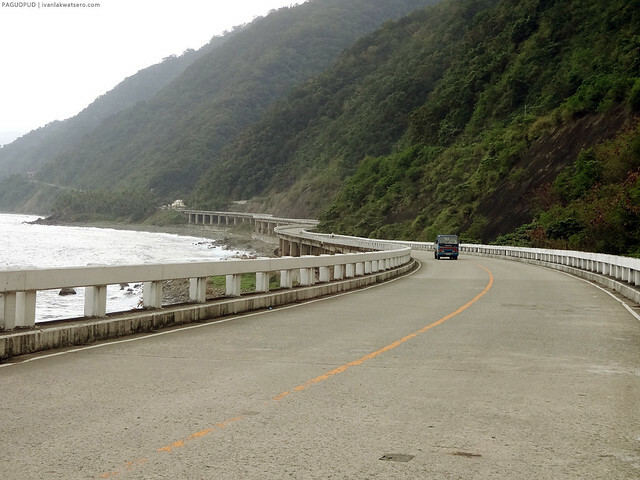 Patapat Viaduct is a 1.3 km bridge built along the coastal mountain slopes to connect Ilocos Norte and Cagayan Province. 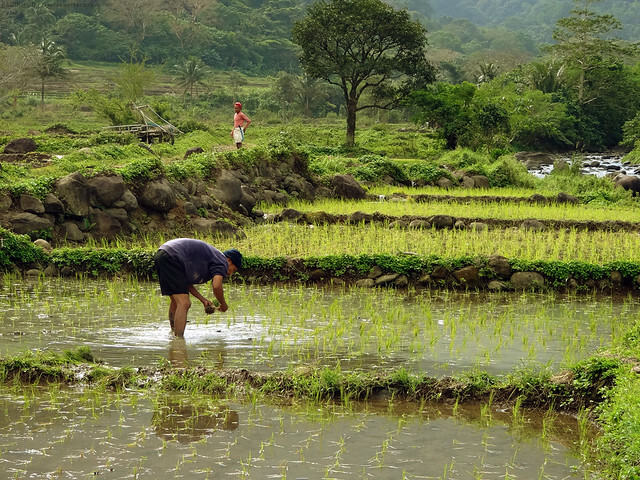 It got its name from the Ilocano term "patapat" which means belt. Constructed during the Marcos Era, it stands the 4th longest bridge in the country. the long and winding Patapat Brigde. 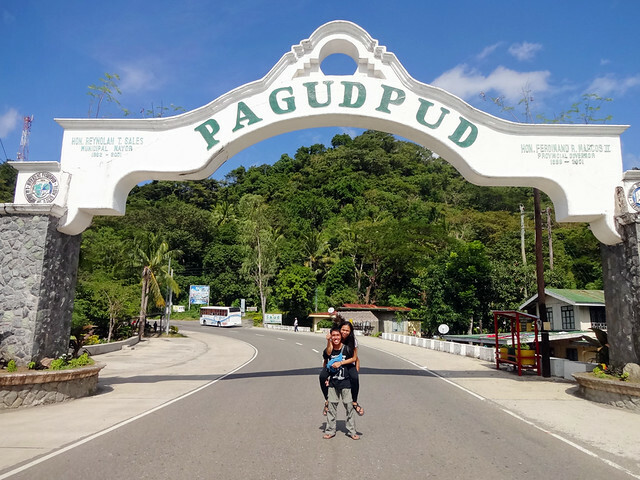 Tourists frequent the place for photo ops as it is being promoted, not only by the town of Pagudpud, but also the province of Ilocos Norte. It is after all an engineering feat that is not common in the country. At the end of the bridge, there's a protected area also promoted by the town, the Kalbario-Patapat Natural Park, aka Paraiso ni Anton. 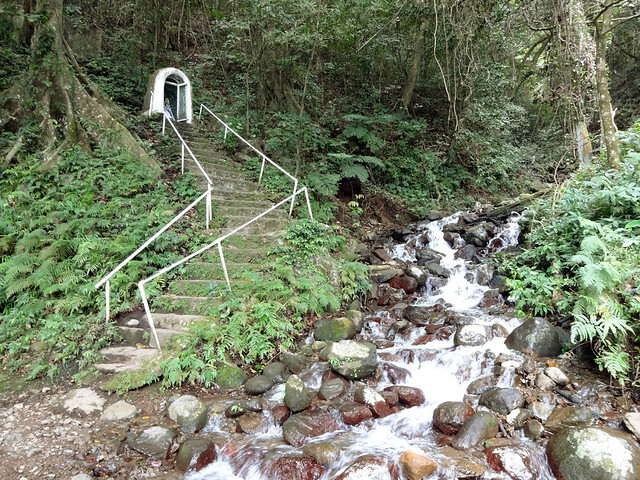 A spring believed to be miraculous can be found in site, hence many go here as pilgrims. While the place looks tranquil, and the spring water, refreshing, I did not find anything really special in the place. Or maybe I was just too excited to go to our next stop. 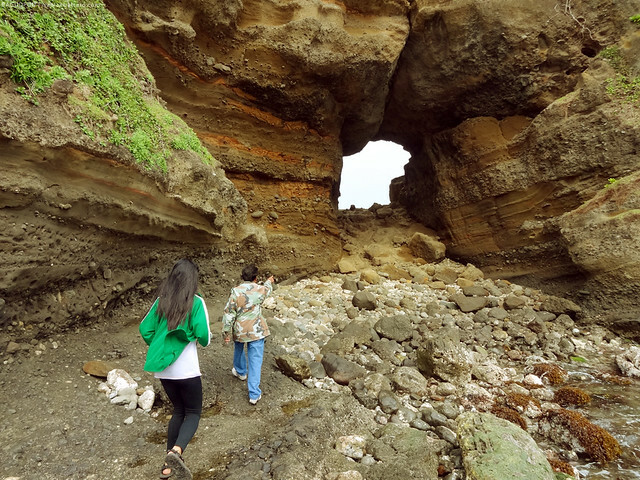 Our next destination was Bantay Abot Rock, a cave-like rock formation carved by constant weathering. Coming from Patapat Bridge, we reached the site after a 10-minute tricycle ride. Actually, our trike also stopped by Dos Hermanos Island, pero wala naman kaming ginawa dun. So we proceeded to Bantay Abot right away. Dos Hermanos Island. Aside from the strong waves that keeps battering the rock island, we did not find anything very special in the place. 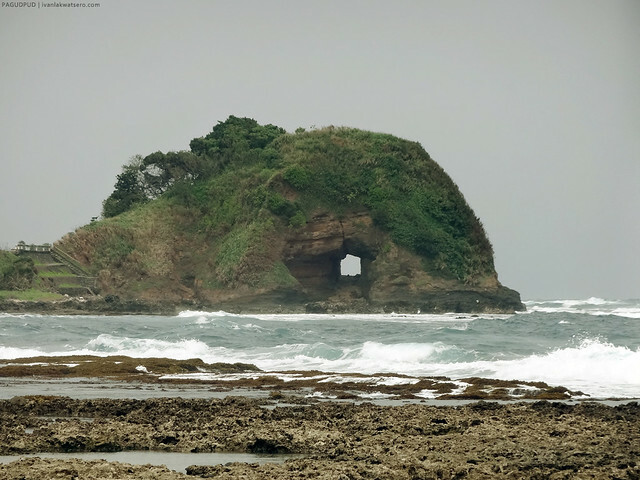 Pero feeling ko, may alamat or kwento sa likod ng lugar na ito, I regret not knowing the story behind this rock island. At the end of the road, we found a stairway leading to the rock formation. 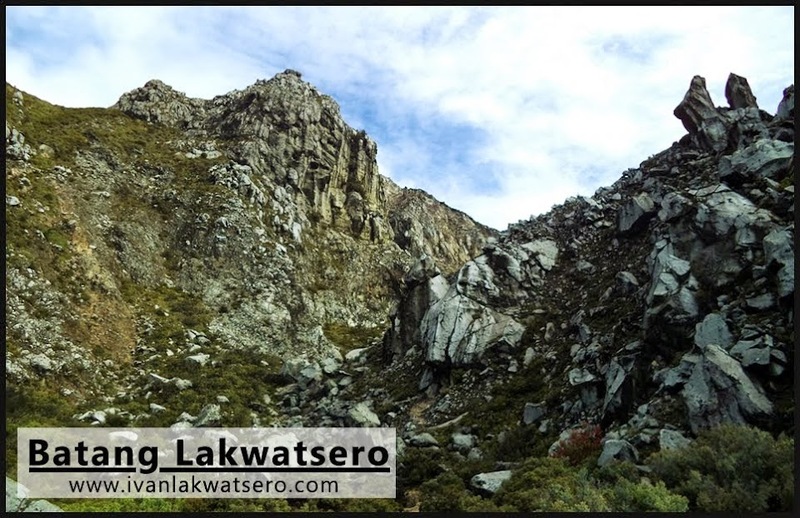 We followed it, then vwalla, a closer look at Bantay-Abot. For me it's the nicest of all the destinations we visited in our tricycle tour, really! The massive stone arch is just too fantastic, lalo na sa malapitan. turista shot sa ilalim ng Bantay Abot Rock. If you're a fan of the Avatar series (Last Air Bender and Legend of Korra), this is the place to be to practice your earth bending fancies. Astig! Anyway, after several photo ops, we carried on to our next destination which is the Blue Lagoon. When I first heard of this place, I thought we were visiting a real lagoon that is color blue. 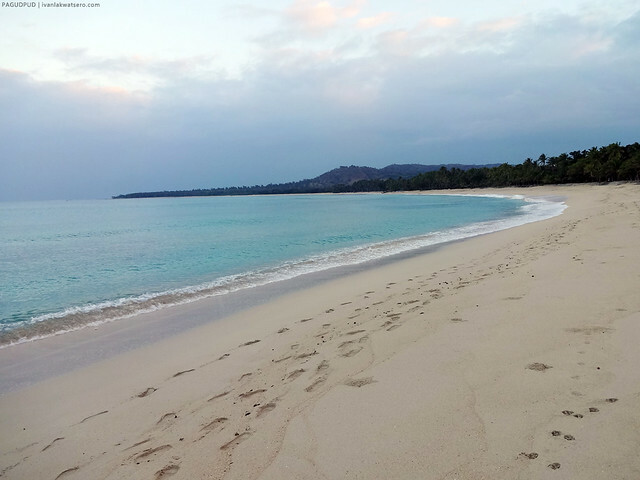 But when we got into the place, we found out that it's just another white sand beach similar to Saud Beach. 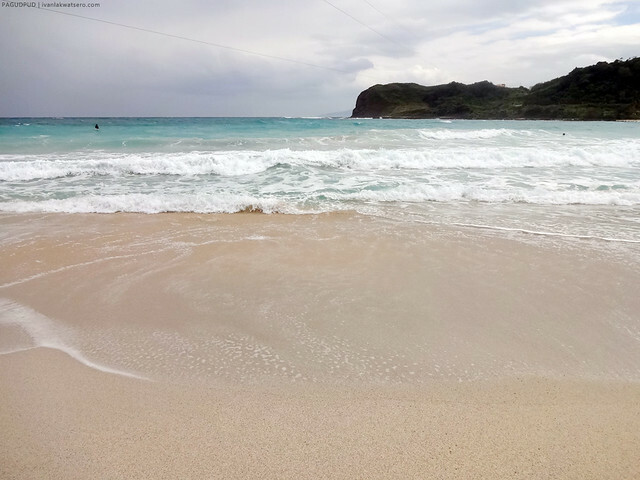 But in fairness to Blue Lagoon, its water does look bluer than anywhere else in Pagudpud. Clear blue sea against the cream white sand of the beach. Before we left the place, our tour guide proudly mentioned that one of the longest over-the-water ziplines in the country can be found in this place, at Hannah's Beach Resort. Dawn, being a zipline virgin, wanted to give it a shot. How can I resist her tiny request? 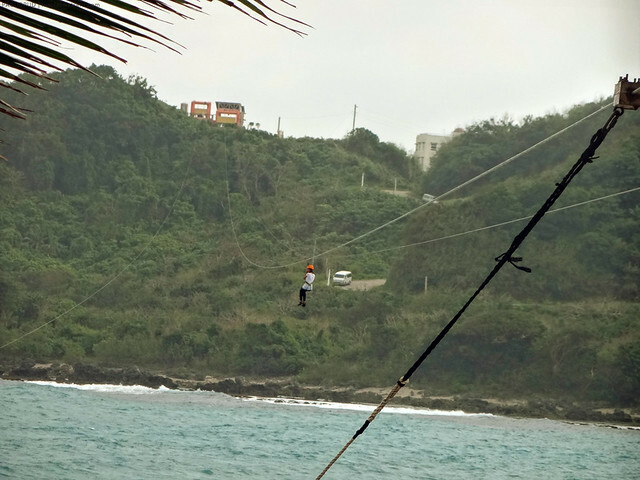 At 1.2 Km, it is believed to be the longest over-the-water zipline in the country. One go costs P750. Our tricycle tour ended with Blue Lagoon. So it took us about 4 hrs to cover all those 4 destinations (kung ako ang tatanunging, sulit na ang P600 para half-day tour, not bad at all). But wait, there's more! Before we headed back to our home in Saud Beach, we asked kuya tricycle driver (sorry I forgot his name already) a tiny favor. and that is to have a photo here at the town's welcome arch. Hoorah! After the tour and a quick lunch in a carinderia in town, we proceeded back to Saud beach. 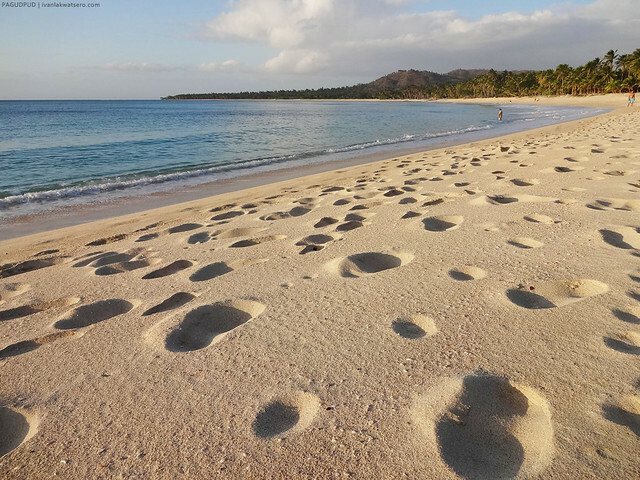 It was on the soft powdery white sand of Saud Beach that we spent the remaining hours of the day. We just lied there from 3 in the afternoon till the descent of the mighty golden sun. Favorably, not too many people were in Saud Beach by the time of our visit. And look at the soft powdery sand of the beach. Nakahahalinang talaga! One of the most beautiful sunsets of 2014 happened on the 20th of January, here in Saud Beach. Watching it with her simply makes it incredibly beautiful. And since it was the last sunset before I turn to the next chapter of my life, it was indeed extra special. Thanks to this wonderful friendly town of Pagudpud, our first day in Ilocos was worthwhile. Now I can't wait for tomorrow. 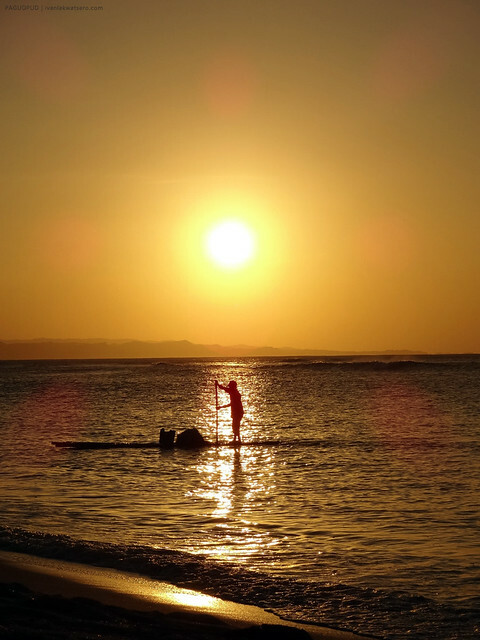 Pagudpud is not just famous among Filipinos but also with the foreigners all around the world. They are just simply breathtaking and world-class as well as they are not populated. may contact no k ng tryke driver mo? Hello po.name ko po Jomar Villaluz at dito ako Pagudpud mismo.nagtotour ako sa tryke and Van naman sa Vigan,Laoag and Pagudpud tour po.my nos.globe 09159074537/09203183945 Good price and Good service po.salamat and God bless!